In his memoirs, Lee Kuan Yew describes a feature of Britain he admired during his days in Cambridge: newspaper vendors would place their publications in public and leave them alone, trusting that people would be honest enough to pay. Can such a scheme work out in Raffles – the school which touts integrity as one of its core values? That was what this correspondent set out to explore. 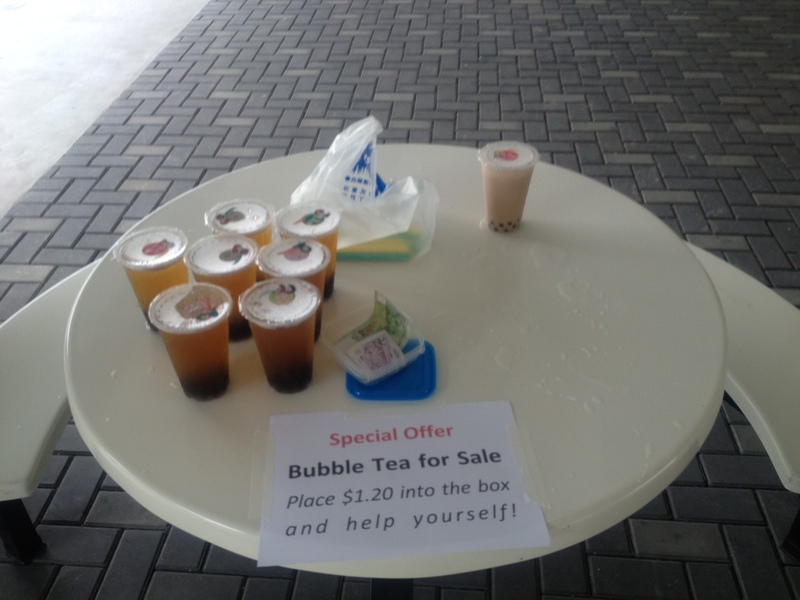 The premise of the social experiment was simple: over one afternoon, 15 cups of bubble tea were left on a table at the S. Rajaratnam Block foyer, where both Year 1-4 and Year 5-6 students regularly passed by. 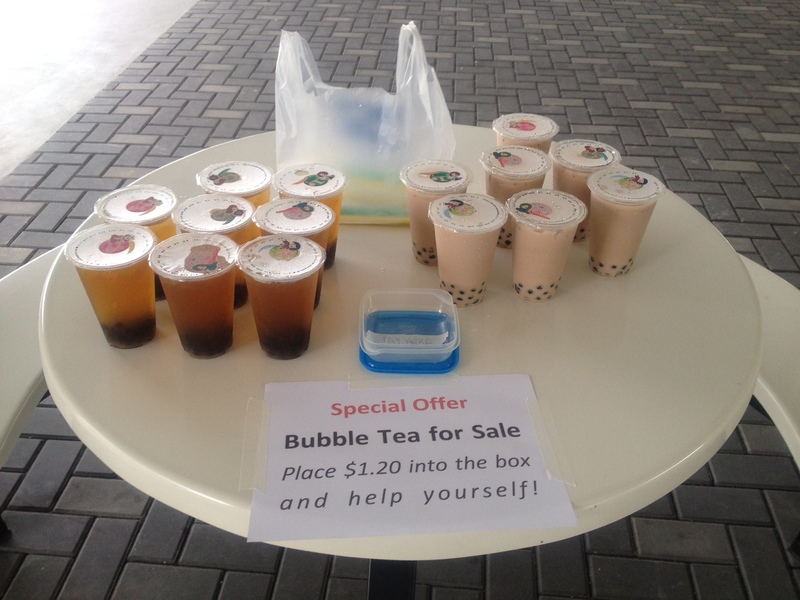 Accompanying the cups of bubble tea was an empty money box, together with a sign that read: “Place $1.20 into the box and help yourself”. Ostensibly, the success of this “honest system” was entirely contingent on the honour and trustworthiness of students. Nonetheless, covert observers were planted in the vicinity to monitor the progress of the experiment. Hours of waiting followed. Would Rafflesians run off with the bubble tea? Or worse, pocket the cash in the money box? Thankfully, the results were reassuring. Of the original 15 cups, 9 had been sold by the end of the experiment. The amount of cash in the money box – $10.80 – corresponded exactly to the number of cups sold. This indicated that all the students involved paid the correct sum, even when there was nothing to deter them from cheating the system. Despite the fact that some students needed change, they did not take a cent more than they deserved. Indeed, several students were spotted hesitating before taking the bubble tea, perhaps contemplating whether to take a risk and help themselves to a free drink, but all eventually resisted the temptation. Of course, these results are far from conclusive in attesting to the character and integrity of Rafflesians. The scope and sample of the experiment was small, and the novelty of the set-up might have made students risk-averse in exploiting the loopholes of the system. The more perceptive amongst them might have thought it to be a trap. Moreover, the amount of money at stake might have been too insignificant to entice Rafflesians to the dark side. Having said that, this outcome was an encouraging start. It showed that by and large, Rafflesians had the potential to be a self-regulating lot, and were not inclined to abuse the trust that was vested in them. As a school which prides itself on producing future leaders for Singapore, such a finding is especially important, given the slew of dishonest high-flying public servants who have been in the news recently. More pertinently, if the results of this social experiment can be replicated, then perhaps it is time for the school to have more faith in its students’ maturity and integrity. Instead of constantly imposing new rules and structures on its students, giving them the freedom to manage themselves might actually bring out the best in them. For now, it seems, most Rafflesians stay on the straight and narrow, putting the “I” in the “F.I.R.E” values of Fortitude, Integrity, Respect and Enterprise. Reblogged this on Ernest Low. I love this site. Keep up the good work guys – I don’t exactly agree with all the sentiments in the blog, but that’s how opinions work. Hope to read more of this in general. try larger sums of money/lesser risk of getting caught. read about paul feldman’s bagel experiments, mentioned also in freakonomics.